Another addition to Roberto Roy’s jurisdiction, celebrated with a no-bid contract with yet another monopolistic multinational corporation. Photo by Transito. All along, the replacement of the owner-operated diablo rojo buses with a quasi-public monopoly has been a problem. It started in the Martín Torrijos administration with his moves to take the diablos rojos off of the streets and this ludicrous mantra about articulated buses being the solution to the Panama City metro area’s public transportation woes. Never mind that such vehicles are too big to navigate most of the capital’s streets. Never mind that to make such a system work properly a new set of bus lanes which other vehicles physically can’t cross or use is required. He had the nation’s largest party and most of Panama’s ad agencies on his side and he may have thought that he could convince those Panamanians who get around on public transportation of anything. But by removing more than 500 diablos rojos from the streets — about one-third of the metro area’s bus fleet — without any replacements ready. 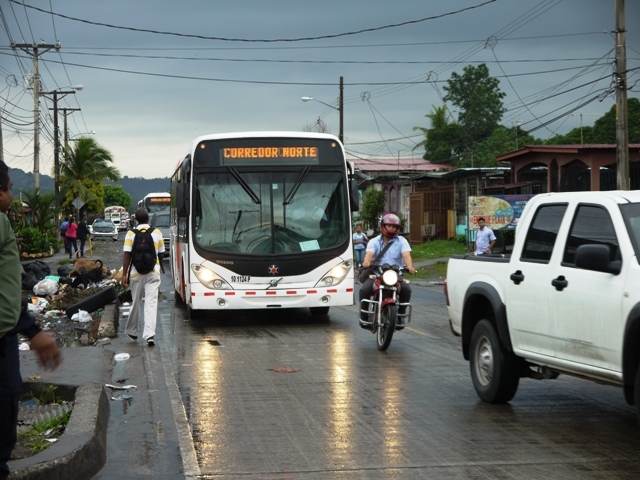 The ensuing chaos and hardships convinced most bus riders that the people running the PRD don’t know or care about their problems and contributed mightily to Ricardo Martinelli’s crushing 2009 defeat of Torrijos’s housing minister. In comes Ricardo Martinelli and he had a plan. Line 1 of the Metro? That was built and people like it. The purchase of a fleet of Volvo buses, to be privately managed by a Colombian contractor, with another private company handling the payment cards? First of all, the Volvos are larger and less agile than what is needed, given the capital’s and San Miguelito’s narrow streets. Soon enough many of the buses showed dings which MiBus, the Colombian company with the Metro Bus concession, routinely blamed on the drivers. Attempts to smash unions representing the drivers and other Metro Bus employees, shorting the workers on overtime and holiday pay. Rider annoyance with too few routes, too few buses and overcrowding tended to get taken out on drivers, adding to the bad labor relations. Martinelli’s takeover of the remaining diablo rojo buses and of their terminals was in many cases little different from gangland theft. Plus there were persistent rumors of the Martinelli family having this or that piece of the action, of the bus or bus card companies being used for money laundering or so on. This reporter has heard many rumors, but not seen any proofs. That these are not playing into the post-Martinelli investigations might have less to do with the facts than with private companies, notwithstanding their public concessions, keeping their records are private. The government would buy out MiBus for some $260.9 million — more or less. One gets that number from adding up the items in the government’s announcement, but there are debts to be assumed, periods in which claims must be submitted and various payments stretched out over as long as four years. Will interest or claims yet to be judged raise the total cost? That’s to be seen. The deal includes the purchase of 1,236 buses acquired since 2010 and in various states of repair, assumption of bank debts for the purchase of these vehicles, assumption of the not entirely determined claims of the now former concessionaire’s creditors, payment of back wages and benefits for the more than 4,000 employees whom the Colombians cheated and an additional payment to TMPSA shareholders. The government has is buying out the Colombian-owned consortium with the Metro Bus concession, the MiBus parent organization Transporte Masivo de Panama SA (TMPSA), and turning it into a state-owned company. (Will they keep the name? At first glance it seems that they will, but do not be surprised if the government’s political cosmeticians suggest a new name to go with a new image.) The purchase is to be made via Transito — the Land Transit and Transportation Authority or ATTT — but then TMPSA is to be turned into a subsidiary of Metro de Panama SA, which runs the Metro trains and is under the Metro’s secretary general Roberto Roy, who is also minister of canal affairs. Roy, while wearing his canal minister hat, is dealing with the results of substandard work by the GUPC consortium that got its contract for the new locks by way of a lowball bid that was accepted by a Panama Canal Authority whose administrator at the time was dealing with members of his family who are part of the consortium. In is Metro secretary hat, Roy recently oversaw a bidding process in which the scandal-plagued Brazilian company Odebrecht, which was not the low bidder won the contract for Line 2 of the Metro on technical points — arcane specifications set by a committee that included a former consultant for Odebrecht. In both the GUPC and Line 2 cases, it was solemnly pronounced that there had been no conflicts of interest. So now that Roy is also head of the Metro Buses, what is the first thing to be done? A no-bid management concession contract with the Minnesota-based multinational FirstGroup PLC, better known by its principal US business, Greyhound. Greyhound, and its Canadian version Grey Coach and subsidiary UK, Puerto Rican and Mexican bus companies, has a record. Its US workers are unionized by the Amalgamated Transit Union (ATU), which is not shy about saying unflattering things about the boss. It used predatory business tactics and endless litigation to establish itself as the US interstate and intercity monopoly by the 1970s — and then downsized from 5,851 destinations served in 1977 to 2,300 now. That downsizing cut a large Mexican and Mexican-American clientele in the Southwestern United States out of service but starting in the 1980s Greyhound created or acquired subsidiaries, which became the cross-border US and Mexican Americanos USA and the intra-US Crucero USA. The subsidiaries had lower safety standards and paid their workers much less than the Greyhound drivers, and when the company began switching routes from Greyhound to Americanos buses the ATU filed complaints with the US National Labor Relations Board. After long and inconclusive administrative proceedings the company agreed in 2013 to merge Americanos and Cruceros into Greyhound.